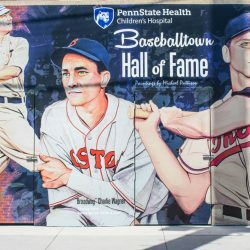 The Reading Fightin Phils, double-A affiliate of the Philadelphia Phillies, unveiled the brand new Penn State Children’s Hospital Baseballtown Hall of Fame on Friday, April 28 before their game against the Portland Sea Dogs. The Hall of Fame is located behind the grandstand in the Tompkins VIST Bank Plaza along the first-base side of FirstEnergy Stadium. Two large flat-screen televisions’ hang in the middle of the mural and will feature video and photos of every inductee since the inaugural class of 1987. The names will constantly rotate and feature historical facts about the player, dignitary and team. In addition, the Baseballtown Hall of Fame also includes a full listing of every inductee, with a photo and a list of their accomplishments. The Baseballtown Hall of Fame, which began in 1987, consists of 118 members and three teams. The Class of 2017, which includes Brett Myers, Michael Spidale and Rich DeLucia, will be inducted on Tuesday, August 15 in a special pre-game ceremony.